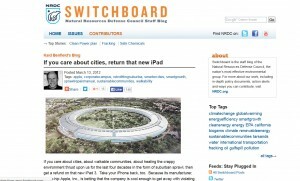 If you care about cities, about walkable communities, about healing the crappy environment thrust upon us for the last four decades in the form of suburban sprawl, then get a refund on that new iPad 3. Take your iPhone back, too. Because its manufacturer, oh-so-hip Apple, Inc., is betting that the company is cool enough to get away with violating even the most basic tenets of smart growth and walkability in the sprawling, car-dependent design of its new headquarters. Don’t let them collect on that bet.